This year’s Presidential election in France will be unusually significant for Australia, though it’s not likely to alter the substance of our bilateral relationship. The interests that Australia and France share  run too deep for that, in sectors of our economies and national security sectors that are too valuable. What might change is the way France manages those interests. France now depends more than ever on its further-afield connections to reinforce the security it’s finding hard to guarantee close to home. It needs its strategic partnerships to yield greater returns than they’re currently designed to do. Now that the Australian-French partnership has grown that much closer, France is in a position to drive harder bargains. Will we be ready to stand our ground when we need to? Even while the Australian-French strategic partnership has been developing with new speed and purpose in the past year , conditions in France itself, and more broadly in Europe, have been deteriorating. There’s more hinging on the French Presidential election than different approaches to the status quo. There’s a stark choice between candidates and parties offering radically different visions for the French State  and its position in the world. Should France continue to regard its prosperity as an integral contribution to, and dividend from, the European Union, and expand free market capitalism within the Eurozone, however stressed it may be? Or should it leave the Union, abandon the Euro, revert to the Franc, protect its industries, quit NATO High Command and reinforce its nuclear deterrent, to act forcefully on its own terms? 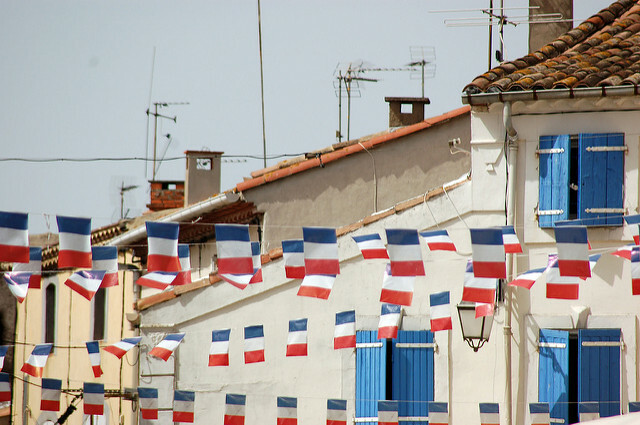 Many consider reshaping the French State in that way an anathema, but it could happen. France is experiencing a rise in anti-establishment sentiment  similar to the movements that led to Brexit and the election of President Trump, and the secession option is focusing grievances. But the election will decide only the climax of a change in French foreign policy that has been unfolding for much longer. France has been seeking diverse partnerships beyond Europe for years, in an effort to alleviate its strained socio-economic situation and offset the major imbalances in the Eurozone, and to boost spending on defence to between 2 and 3% of GDP. That’s one principle on which all the major presidential candidates—centre-left , independent , centre-right , and far-right —agree. The efforts of the present administration in this respect became more earnest last year, after the shock of Brexit, and after Trump declared NATO obsolete  while campaigning in the Republican primaries (although he has since stated that he does support the Alliance ). The European policy response could be described as a tale of two White Papers. In June and July 2016 respectively, France and Germany published definitive security strategies. Those indicate a common concern that traditional structures mightn’t be enough to guarantee European defence. Both states seem to sense grave uncertainty ahead but they outlined utterly contrasting approaches to weathering it. Germany’s White Paper on Security Policy and the Future of the Bundeswehr (the Federal Defence Force) focused on counterterrorism and conflict resolution in European territory, and characterised force posture and military preparedness as demonstrations of resolve towards a confrontational Russia. Critical to that, the White Paper declared, was the need to strengthen NATO’s ‘European pillar’ (p. 49), while also encouraging individual European states to invoke Articles 42(6)  and 46  of the Treaty of Lisbon and build their own bilateral or multilateral defence links, ‘to make progress towards more reliable cooperation among those who see the need for it’ (p. 73). Even as Germany declared that it needs to increase its contribution to NATO , it was also seeking an insurance policy. Contrast that with France’s White Paper, which was an update to its 2013 White Paper on Asia-Pacific Security. Both versions invoked NATO as a matter of course, but the Alliance was conspicuous by its marginal role, next to France’s strategic interests far away from the North Atlantic, particularly its expanding network of long-term armaments contracts in Australia, Malaysia and India. Those contracts are the mainstays of growth in France’s only booming domestic industry . Australia’s $50 billion submarine contract was greeted enthusiastically  in France, representing a major return on the new Asia-Pacific venture. In addition to industrial projects, France has also been capitalising on the strategic value of its overseas territories. It’s the only continental European power capable of attempting global diversification via political and commercial means. Its territorial assets incorporate large areas of the Caribbean Sea and the Atlantic, Indian and Pacific Oceans. In recent years, France has increased the size of its EEZ  to expand its fishing and mineral extraction rights. And France is making efforts to join governance bodies and economic communities well beyond the reach of its European neighbours. Last year, New Caledonia and French Polynesia, and thus France, were admitted to the PIF . More than just access or influence, France is seeking legitimacy: more seats at more tables, and recognition that its role is constructive, persuasive, lucrative, influential, un-ignorable—and not dependent on the European project. If France becomes isolationist after this year’s elections, it might be much less amenable to independence debates currently unfolding in several of its territories. New Caledonia votes on its future in 2018. While the referendum process has been handled carefully so far , the situation is delicate, and stability depends on consensus. Viewing the situation from Australia (outside specialist areas of policy) it’s difficult to appreciate France’s situation, or its implications for us. The truth is that France needs us—seriously. Thanks to the DCNS submarine contract, we’re now committed to sharing the most sophisticated government information and expertise , in the service of critical strategic and industrial policies. But France’s economic dependence on those connections has grown disproportionately larger and more urgent, precisely because of their long-term value in deeply uncertain times. France has always been there , but we’ve never needed to get to know it so deeply, so fast. We’ll remain broadly like-minded , but will Australia understand precisely what’s on France’s mind after April’s elections? Will we be ready to adapt if our friend and partner changes countenance and expects our partnership to deliver more, sooner? Theo Ell is an employee of the Department of Defence. This article was written while he was on secondment to ASPI and it reflects his personal views, not those of the department or the Australian Government. The article concludes a series on new dimensions in the Australia–France relationship. Image courtesy of Flickr user Sjoerd van Oosten.